In this episode of The Profit CNBC, Marcus lemonis, our favourite CEO visits Eco-ME. 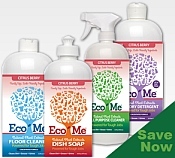 Eco-Me is an all natural cleaning products company founded in 2006 by best friends Founded in 2006 Robin Kay Levine CEO and Jennifer Mihajlov (CFO and 12% owner). The idea was to create a safe, all-natural cleaning products line came when Robins’ sister was diagnosed with breast cancer. Robin decided to only use natural products while helping to clean her sisters’ apartment and the business was born. Made with food grade ingredients. Last year (2012), the business did half a million dollars in sales with 6 employees. The business is basically running on fumes and is in need of serious help. Marcus loves the idea of natural cleaning products and has a plan to turn Eco-ME into a $10,000,000 company. In this multi-billion dollar industry of cleaning products, this is not going to be easy, as he soon finds out that friendship may sometimes get in the way of business success. Close to $500,000 in debt with friends and family leveraged to the hilt. Owners of the business have not taken a paycheck in months. No significant machinery for product production, making the process ultra slow, laborious and inefficient. Sales manager Jen, based in the east coast, 3000 miles from the business office in the west coast. Use of friends names (Bill, Emma etc…) on the various product which creates branding confusion with the clients. Major re-branding and product packaging update. Sales department has to be revamped. Better overall management of the business. Invest in machinery to increase production from 1200 bottles per day to 1200 bottles in 20 minutes. Selling the cleaning product range to hotel chains. Marcus offers Robin $500,000. He promises to finance the inventory, machinery for product production, pay off the debt and fund working capital for 20% of the business. Robin straight-up calls him crazy lol. She doesn’t want to give up that much of the business she created from scratch. She counters with a deal of $250,000 for 10% of the business. Marcus reminds her that the business may fail without the right investment. They agree and the deal is done on Marcus’ terms of half a million dollars for 20% of the business. As usual, for the deal to be effective, Marcus takes full control of the business for about a week. Robin is scared Marcus may fire her staff so he tells her that business is not personal. All is settled and Marcus writes her a check of $500000 on the spot. Now Marcus is in control of the business, he takes Robin and Jen to see ACCUTEK packaging equipment companies, the company that will be creating Eco-Mes’ bottling machinery. It’s all oohs and aahs as they see machines that will totally eliminate their archaic bottling process and improve Eco-Me production 24 times over. With this new increase in production, it’s up to the sales department now to generate the demand to keep up with the new production figures. So Marcus brings in his camping world buyers to test the sales skills of Jen and she doesn’t really deliver on her pitch. The personal names of people on the packaging present itself as a problem once again so it will need updating on a total brand level. Drama ensues as Marcus tells Jen she is not good at selling. Robin says that is BS and that Jen deserves an apology. Marcus says it’s a business and the fact that the owners are friends doesn’t mean that Jen is good for her sales position. Later on in the show, at a camping world store, we finally see that Jen lacks the basic sales/persuasion tactics as she aggressively tries to force her products on clients. Slamming other products to try to sell hers wasn’t such a good idea either. After that unsuccessful exercise, the Eco-Me team are made to interact with a focus group to determine how effective the current branding is. They are shocked as the group is totally lost on what the product really is. They don’t care for the personal names on the products either. The product packaging failed the focus group test. Potential customers of the product need to be able to identify with it so Robin and Jen agree it’s time to update it. So enters Derek, the VP of creative of camping world. He has some new concept graphics to show the Eco-Me team. Robin hates the new creative, she says its too “mass market”, too “P&G”. Marcus reminds her that P&G is a multi-billion dollar company. He says he is in charge and he will move ahead with any change not just look better but generate more sales for the company. Here are the before and after images of Eco-Me products. The branding and packaging look much better now. Next, in the episode, Marcus explains how important hotel chain accounts are for a product, so he sets Jen a sales meeting with Strand hotel NewYork. After almost losing the deal to lack of skill and unpreparedness, Marcus jumps in and tries to rescue it with an offer to do a free trial of the product. Here again, Marcus shows his genius and also that he is not scared to roll up his sleeves and work. To the surprise of the hotel managers standing by, he takes the brush from Jen and scrubs the WC of the hotel room after Jen confesses that she DOESN’T clean her home toilet herself. The Strand Hotel gave a very good feedback on the product and may be ordering a trial. With Jen poor performance with the sales meeting/demonstration, Marcus drops a bombshell. He won’t go ahead with the deal if Jen is in charge of sales. Jen storms out for a quick cry. Calm returns to the episode as Marcus consoles Jen and asks her if she is willing to undergo sales training, she agrees. Back in the office, Robin changed the final graphic of the product after agreeing to Marcus’ suggestion. She and Marcus have a quick argument about it and they promise to agree together before taking big decisions. Finally, Accutek delivers the bottling machine and it’s incredible how updated the Eco-Me production plant is now because of this. The staff are present and in awe as the Accutek engineers show how the packaging is done by the machine. At this stage, Marcus has paid off almost all the debt of the business and would have invested over $500,000 in the business by the time it is all said and done. The brand of the product is now very clear. 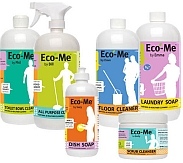 The labels on the products explain what the product is and shares the Eco-Me story. It’s all looking good on the road to 10 million dollars in sales. In this very successful episode, Marcus was able to resolve problems with his People, Process and Product Strategy. Jen is now improving in her sales and has lined up many major deals across the country. Robin has grown a lot in her managerial skills. Congratulations!!! Eco-Me is now on the way to great SUCCESS. I hope you enjoyed our episode review. Feel free to comment below and join the discussion. Thanks again for your visit. Looks like Eco-Me Has been sold! checked the Eco-Me website and it says it has been bought. The blonde should have been fired, she is horrible as a salesperson. Before the year is out, he sold Eco-Me. Dumped it?? Would like to know the fine print of that deal.. Without the details it is all show business. Looks to me like they are making “content” and not companies. I wonder, did they ever make it to $10M either pre or post acquisition? Honest Foods Catering Review & Update. Windward Boardshop Review & Update. Zoe’s Chocolate Co. Review & Update. Hip Pops Review & Update. Bodhi Leaf Coffee Traders Review & Update. Overtone Acoustics Review & Update. Ashtae Products Review & Update. Swim By Chuck Handy Siloett Review & Update. Susana Monaco Review & Update. Francine Magett on DiLascia Review & Update.